The hunt for further evidence following the gruesome murder of a woman in Peterborough is continuing this morning, Tuesday June 9. Police investigating the murder of a woman whose body was found in a suitcase have been focusing on searching two areas of land near Peterborough city centre. Scenes of Crime officers have been scouring land at the back of Toys R Us, off Bourges Boulevard in Peterborough since yesterday looking for clues following Friday’s grim discovery of a woman’s torso in the bag. Forensic officers in white body suits are also searching in Lime Kiln Close, off near-by Westfield Road. The searches are believed to be part of detective’s efforts to find missing body parts of the woman, who has not yet been identified. Officers are also still at the address in Mayor’s Walk where the body was found, and a detailed forensic examination was taking place in the house. A Cambridgeshire police spokesman said detectives were still not sure where the murder was carried out, and part of the focus of the investigation was trying to discover the crime scene. A post mortem into the woman’s death is being carried out at Peterborough City Hospital today. Investigators are still appealing for help to trace a woman believed to be the partner of 57-year-old Vitautas Jokubauskas, who is only described as being about 40, slim, with black hair and Lithuanian. 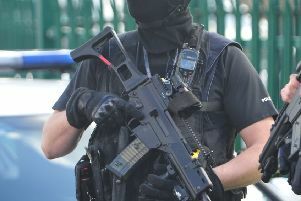 Meanwhile officers are still questioning a 57-year-old man at Thorpe Wood Police Station. They have until 7.30pm to hold him before they have to request a superintendent’s extension unless a decision is made to charge, release or bail the man. The murder is being treated as an isolated incident and a dedicated team has been set up to investigate.